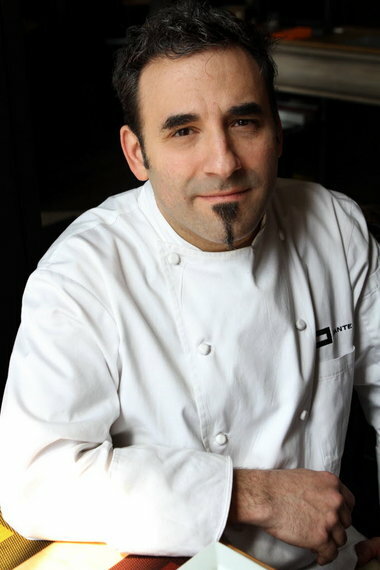 Dante is Dante Boccuzzi, who owns a number of restaurants in Northeast Ohio. The chef at his eponymous Akron restaurant is actually Ernie Cornelius, but Dante’s fingerprints are all over it. So to speak. And here, the heavily tattooed Ernie works in the kitchen. For an interview with Ernie, click the photo. Dante’s place in Akron used to be VegiTerranean, owned by Chrissie Hynde. It was a completely vegan place and we loved it. I always hoped to see Chrissie there, or even Ray Davies stopping by for a chat. No such luck. We were anxious to see the space taken over by a place we could enjoy, and Dante has been mindful of vegetarian and vegan patrons. To match the food, I started with a celebratory glass of Prosecco, then moved on to a Pinot Bianco. 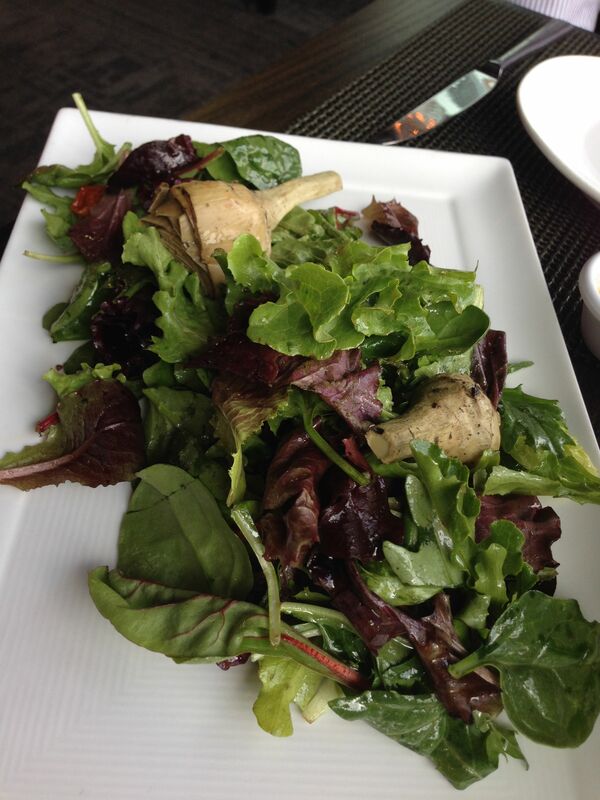 The first dish was this salad of grilled artichokes and very fresh mixed greens, dressed with a light but sharp vinaigrette. Very refreshing (and I loved the baby chard). Next up, a sampler of grains and pastas. This one included beet cavatelli, mushroom risotto, and “green spaghetti.” All were excellent, with rich aromas and great texture. 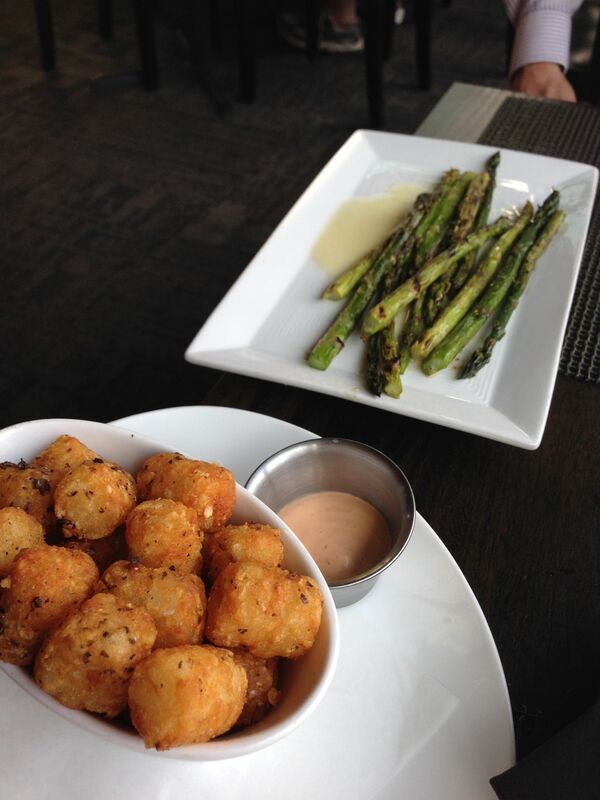 There’s something about grilled asparagus. You don’t need meat in order to enjoy that carbonized flavor, and on certain vegetables, it’s classic. These asparagus spears were nicely browned, with a bit of lemon butter for sparkle. Even more fun: tater tots with chipotle sauce! I am a total sucker for a tater tot, which is a small blob of grated, deep-fried potato. These had an interesting crispy crust with a distinct hint of sugar in the coating. Irresistible. And as you can see, Ernie isn’t stingy with the tots. This illustrates a bit of restaurant wisdom that works for me as a vegetarian: always investigate the side dishes. Sometimes they are phenomenal. 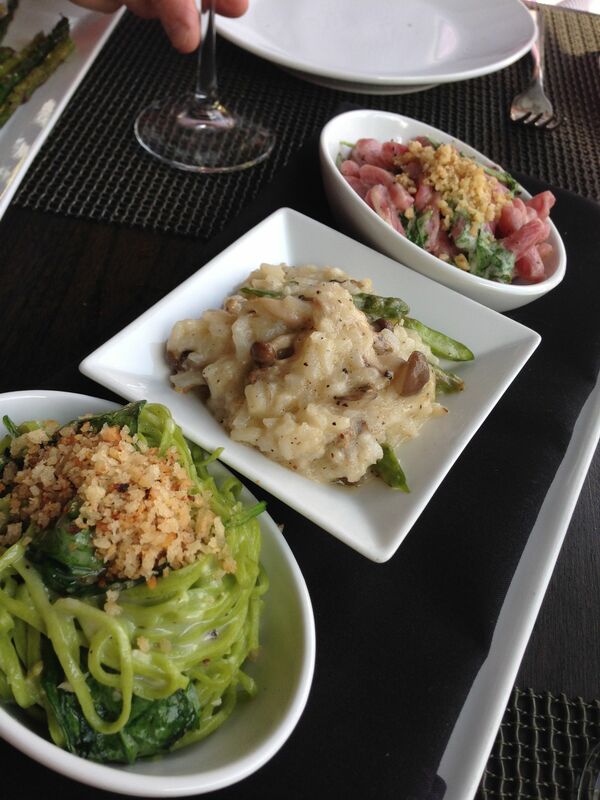 At a really good place, you can assemble an outstanding meal from the sides. We decided to end with the cheese plate, surprising the servers. At Dante the cheese plate is on the starter section of the menu. But I am partial to the French custom of enjoying either cheese or dessert, but not both. 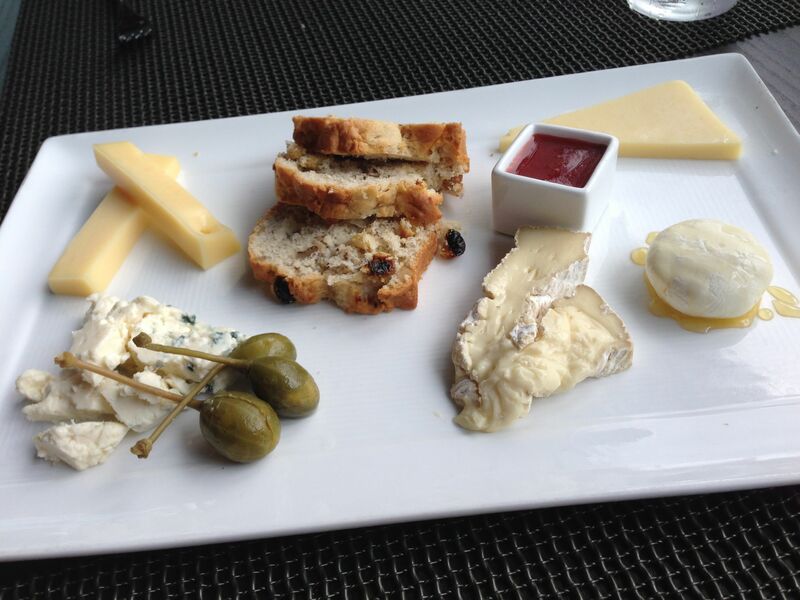 A cheese plate is very much a test of the quality of the restaurant. It requires knowledge of the cheeses themselves, of the right pairings, and most important, knowledgeable service. I’ve had plenty of cheese plates brought directly to me from the refrigerator, and unripe cheeses that should never have been served. On this plate, the cheeses were ordinary (except for the soft ones, a tiny round of chèvre and an interestingly funky brie, I think it was). But they were served with the proper respect. Caper berries with the blue, some fruit and nut bread, and a dipping sauce with tropical flavors (instead of the “fruit compote” promised on the menu. Sometimes the best thing about a tater tot is the name, but these were magnificent. It’s a good way to get more veggies! Crispy, creamy potato and grilled tender asparagus, hoo ha. Yes, we always look at the sides for the hubby to make up or add some interest and substance. Oh, yes, cheese and mostarda sounds great. In general, American cheese plates tend to be basic, with just some fruit and nuts, maybe a quince paste as accompaniments. We do have more and more artisanal producers now, so I think more could be done with fresh cheeses. Thanks Paul! It was a delicious meal.